You enjoy putting shapes together to make things. You can put things together that are like each other. You can choose the right shape to fit in a picture or a model. You can spot patterns in lots of different places and talk about them. You can use words like on, over, under and in to tell people where things are. 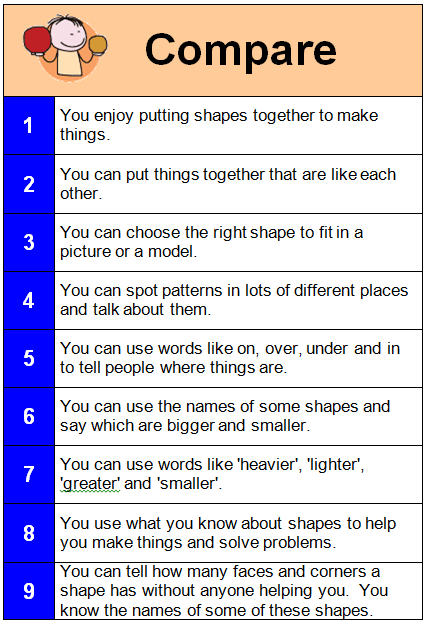 You can use the names of some shapes and say which are bigger and smaller. You can use words like ‘heavier’, ‘lighter’, ‘greater’ and ‘smaller’. You use what you know about shapes to help you make things and solve problems. You can tell how many faces and corners a shape has without anyone helping you. You know the names of some of these shapes.